We asked seasoned expat Russell Ward for his top tips on living abroad. I’ve lived abroad and called myself a British expat for more than ten years. It feels like only yesterday when I packed up my house, jumped on a plane and took my family with me to Canada then Australia. You learn a lot during that time. When you’re alone and away from your support network, when friends and family are absent, and when every day presents new challenges, you cannot hide from yourself. When you move abroad, you find out who you really are and what you’re capable of. If I had my time again, I wish someone had sat me down and told me their top tips to help ease my international transition. After ten years abroad, if I was given five minutes to divulge the top three things I’ve learned from living abroad, what would they be? Arriving in Canada, I had no immediate contact with family back home, I’d quit my corporate job for a return to university, and I was living temporarily with relatives I hadn’t seen in many years. Every day was unfamiliar and every experience unsettling but I’d signed up to this way of life and I tried hard not to complain. If I negatively compared life in my new home to the way things were back in the UK, I saw a certain look pass across the face of my host – a mixture of pity and annoyance. I soon learned to forget unnecessary comparisons, positively acknowledge the differences, and accept the choices I’d made. For if I didn’t like that choice, it would be easy enough to pack up and return home. Once I landed in Australia, no amount of planning prepared me for the shock and awe of the Sydney housing market – from how expensive the houses were to the immense buying competition for any given property. We weren’t entirely sure where the affordable suburbs were and we wanted to finalise a mortgage fast. My wife had been away for seven years, yet even she still struggled to gain credit from the banks. We had to work fast to understand how to achieve financial security in this new country. From the absurd to the crucial, I’ve learned the importance of being on the ground and moving quickly to understand the local environment in terms of finances, housing, healthcare, schools, jobs, and so on. Planning is great but planning isn’t perfect. You need to hit the road fast upon arrival and get up to speed as soon as you can. Living abroad can be a double-edged sword. You explore wonderfully different places, meet fascinating people, and try extraordinary things. Yet you do this away from the comfort of your home of origin and you may feel guilty or uncomfortable at doing so. You may start to feel settled and established, then perhaps a sly comment or an unguarded word from a loved one made you reflect on your decision to leave. It’s Christmas and you have to miss the annual family reunion. Maybe you chose a local holiday rather than fly back to where you’re from. If your parents are ageing or someone is sick in the family, your decision to “abandon the family” in pursuit of a better life can seem difficult to reconcile. It is possible to replace feelings of guilt with a belief that the choice you made to move was the right one. In my experience, make the decision to leave, believe in it, and find peace with that decision – or face a future of uncertainty and unease. But you really need to find out for yourself because these are just a few of my thoughts from ten years of living abroad. 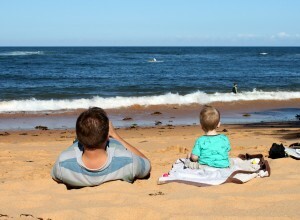 Russell Ward is a British expat living on Sydney’s Northern Beaches where he writes about his search for a life less ordinary at www.insearchofalifelessordinary.com, one of Australia’s leading expat and travel blogs. He also writes for businesses and brands at www.theinternationalwriter.com and can be followed on Twitter as @russellvjward.